A Nurse Practitioner who demonstrates an unwavering commitment to patient-centred care is the 2018 President’s Award recipient. Don Versluis was presented with Niagara Health’s top award for extraordinary performance at our Awards of Excellence celebration on May 22 at our St. Catharines Site. In his nursing role in Internal Medicine, Don is committed to serving patients in the best way he can. Over a fairly short period of time, Don has adapted his practice at the St. Catharines Site to support patients throughout the Medical Assistance in Dying process. He understands the new legislation and shares his knowledge and experience with others. Don successfully helps our patients and their loved ones navigate through this challenging time. His colleagues often stand in admiration of his strength and commitment. In addition to the President’s Award, which celebrates and recognizes the individual making the most impact, seven awards were presented to individuals living our CORE values of compassion, optimism and achieving ambitious results. All of the recipients were nominated by their peers. Angela is a compassionate and highly skilled physiotherapist whose dedication to her patients, their loved ones and colleagues goes beyond words. Angela cared for a patient requiring rehabilitation therapy following a tragic accident in which he lost his wife. Angela worked closely with the patient’s family, making arrangements on her personal time, to ensure the patient could attend his wife’s funeral despite mobility, accessibility and health challenges. Doris is a role model for new staff and the entire team as to what compassion in action is all about. She came up with the idea of placing a magnetic butterfly on the door of each palliative patient’s room and dimming the lights when the patient passes away, so that everyone on the floor can support the family during this difficult time. Sherri never does anything without putting her whole heart into it. If there is a new volunteer program at the St. Catharines site that benefits our patients, Sherri is on it, doing whatever it takes to make sure it’s a success. From fidget aprons for dementia patients to the Patient Visiting Program, Sherri approaches everything from a “how much can I do” perspective. Watching her reach for the stars creates an energy around her that causes others to do the same. Dr. Yelamanchili leads by example, inspiring those around her through her strong work ethic and commitment to her patients. She has led a number of patient care initiatives bringing Total Parenteral Nutrition (TPN) to the Outpatient Oncology Clinic and a survivorship initiative for breast cancer patients, ensuring patients are well supported after their treatments have stopped. She practices whole person care, such as coaching patients through anxiety and life challenges, never leaving a stone unturned. She inspires the people around her to work harder, learn more and do more for our patients. Derek is always mindful of the needs of our patients and their loved ones. Whether it’s offering patients a warm blanket, bringing them water, escorting a family member from the waiting room or getting a wheelchair to discharge a patient home – he is always there to help with a smile on his face. Often, Derek quietly completes the task before his colleagues have a chance to ask for help. Derek puts the well-being of others first and shows tremendous compassion for everyone around him. After only one year in his role, Krita created a workplace where innovative ideas quickly become a reality. One example is a new 3D printer used for constructing minor parts for medical devices. His determination is leading the department through a second Peer Review - an audit of the preventative maintenance program - by the Canadian Medical and Biological Engineering Society. Only a handful of hospitals in Canada have received this distinction as a Best Practice Biomedical Engineering Department. 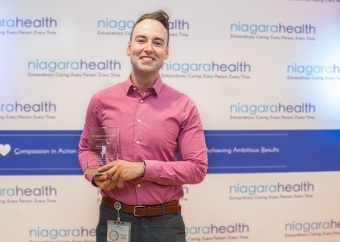 The multidisciplinary ICU team decided to bring the Three Wishes program, which originated in Toronto, to Niagara, as a way to personalize end-of-life care. Patients and their loved ones who make the decision to have their ICU care withdrawn are encouraged to let staff know what would help provide comfort through this journey. It might be having a slice of their favourite pizza, covering the transportation costs for a family member to visit or having spiritual care at the bedside. The team makes these wishes come true, and recognizes how important small moments are within the big picture of care.